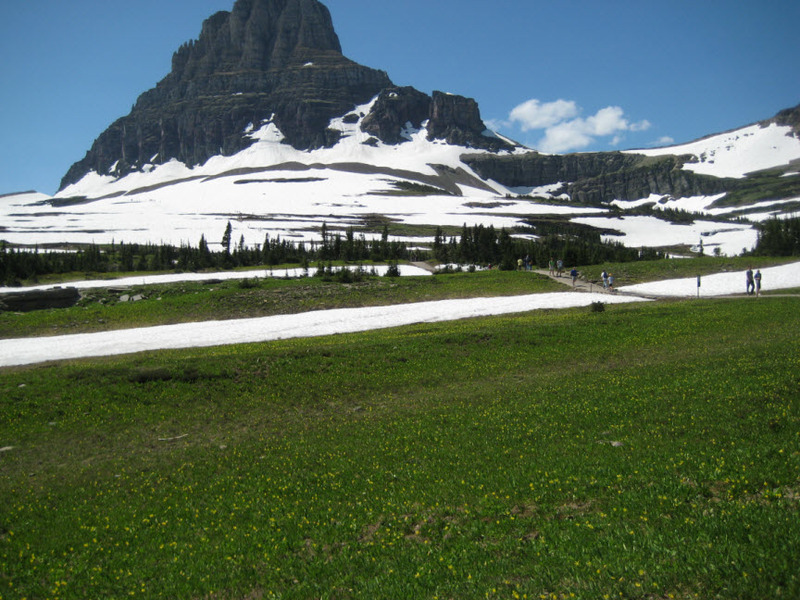 When we started planning the Glacier National Park portion of our vacation, I was a little bit at a loss. It had been more than 30 years since I’d been there, and I didn’t have any good ideas about where the best places to stay would be, or what the must-see sights were. From what I could tell, the things to do were 1) hike, 2) drive Going-To-The-Sun road, and 3) admire lovely scenery. Based on this information, I made a plan. We’d arrive Monday afternoon, early enough to do a short hike. Tuesday would be more hiking, Wednesday would be driving the pass, and Thursday we’d make our departure for Bozeman. That plan didn’t even make it through Monday. First of all, I underestimated the time it would take us to get out of our hotel that morning. I’d also forgotten about the time change between Idaho (where we stayed the first night) and Montana, so what was a three-hour drive turned into four hours on the clock. We had to make a couple unscheduled stops – first, to top off the oil in the car, and second, to load up on fresh cherries. By the time we arrived at our hotel and home for the next couple nights, it was already around 5 p.m.
Tuesday did start out according to plan. Armed with a list of day hikes that we’d gotten at the hotel, we set off for the park. We found a trail that led to a waterfall, and we also walked the Avenue of the Cedars, a short enough and flat enough trail that we let Kiddo run instead of loading him into our carrier. “We could do that,” my husband said. And there went my plan for Wednesday. 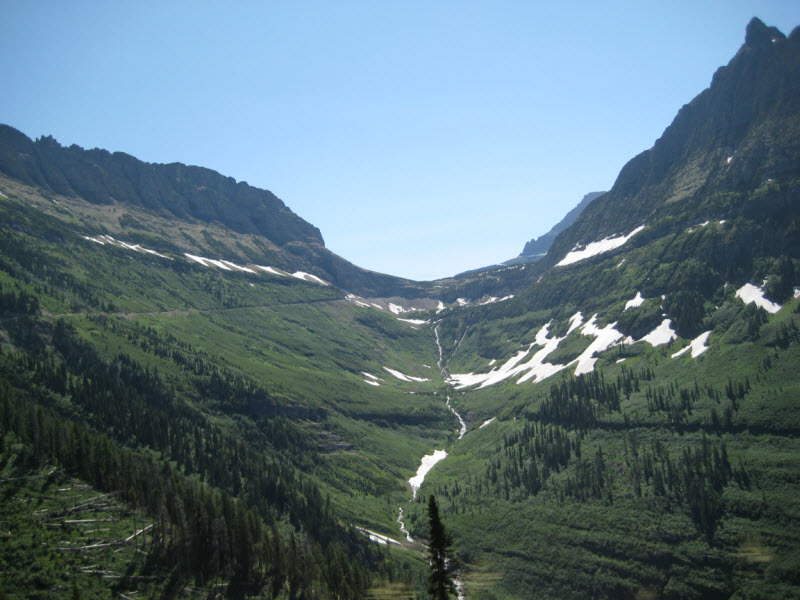 Rather than driving over the pass, we’d do some more day hikes, and then on Thursday we’d start our drive to Bozeman via Going-to-the-Sun road, exit the park on the east side, and proceed from there. Wednesday morning we picked out a couple more day hikes around the lake, and drove to the park. And were thwarted by Kiddo before we even got to the first one, because he fell asleep just as we entered the park. 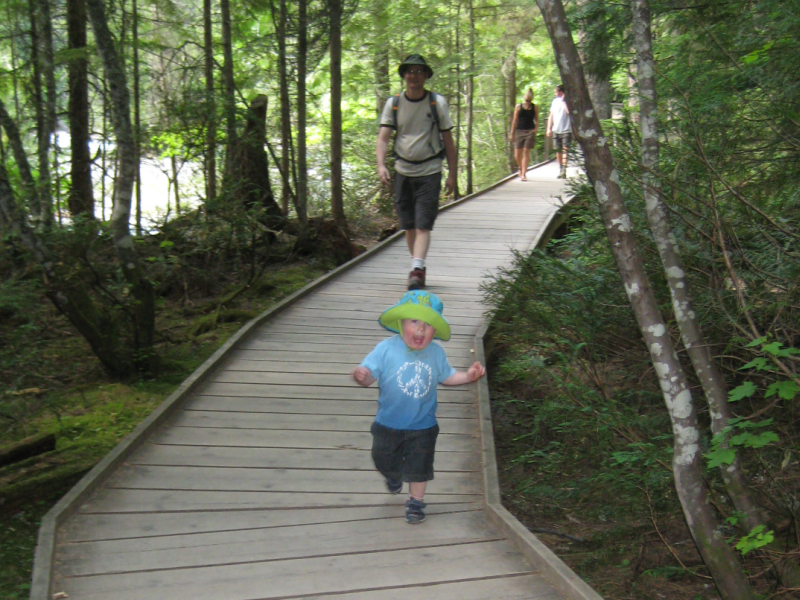 To preserve the boy’s naptime, my husband suggested we continue up the road for a bit, then come back. 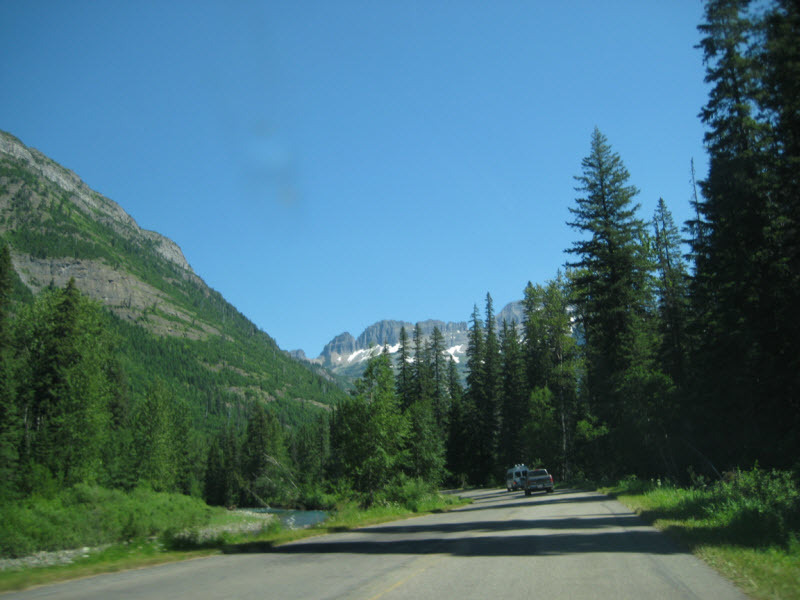 By the time we found a scenic pullout, we were well on the way up Going-to-the-Sun road. And that was when we made what turned out to be the pivotal decision for the day. 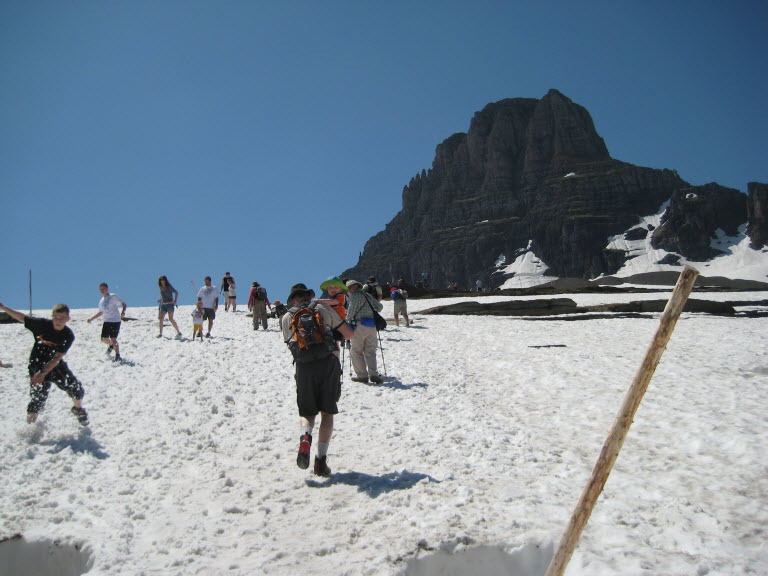 Why not continue on to the visitor center at the top of Logan Pass, and hike around there? Well heck, why not? 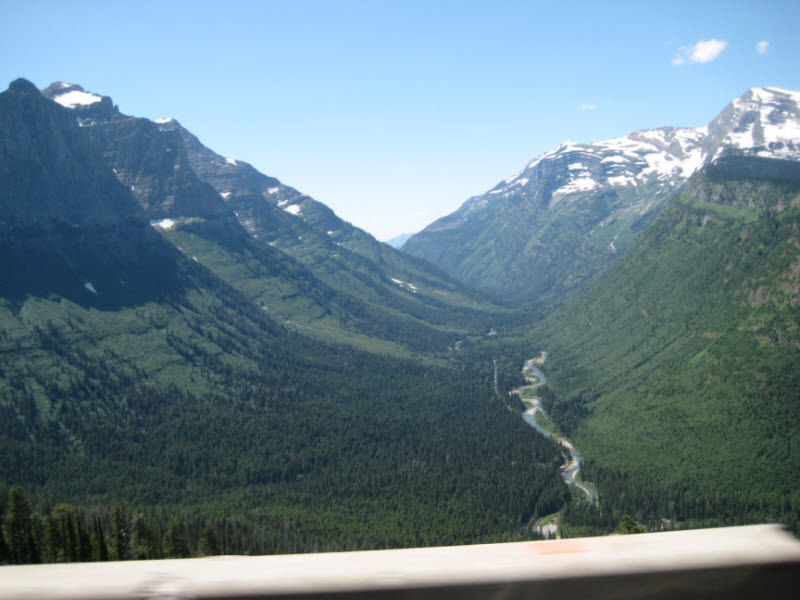 And as we continued, I found out what it is about Glacier National Park that brings people back year after year. The scenery was breathtaking. I was snapping pictures out the window every mile. My husband, on the other hand, had to pay more attention to the winding road hanging off the side of the mountain. “Tomorrow I’m driving this, so you can gawk,” I said. But the day was just getting started. At the visitor center, a ranger showed us two hikes we could do: one to Hidden Lake overlook, and another that made its way along the mountain wall we’d just climbed. We opted for the lake, since it had a definite endpoint. That hike is one I’m going to remember for a long, long time. Glacier had had more snow than usual this past winter. Even though it was summer down in the valleys, snow fields remained up top. The hike to the lake is a boardwalk path, but even so, a good part of our 1.5-mile trek out there was covered in snow. Like most of the other hikers, the three of us we were wearing shorts and t-shirts (and sunscreen. Lots of sunscreen.) But that wasn’t a problem – it was 68 degrees outside, and all that high-altitude climbing kept us warm. We let Kiddo walk for a while, even through the snow. 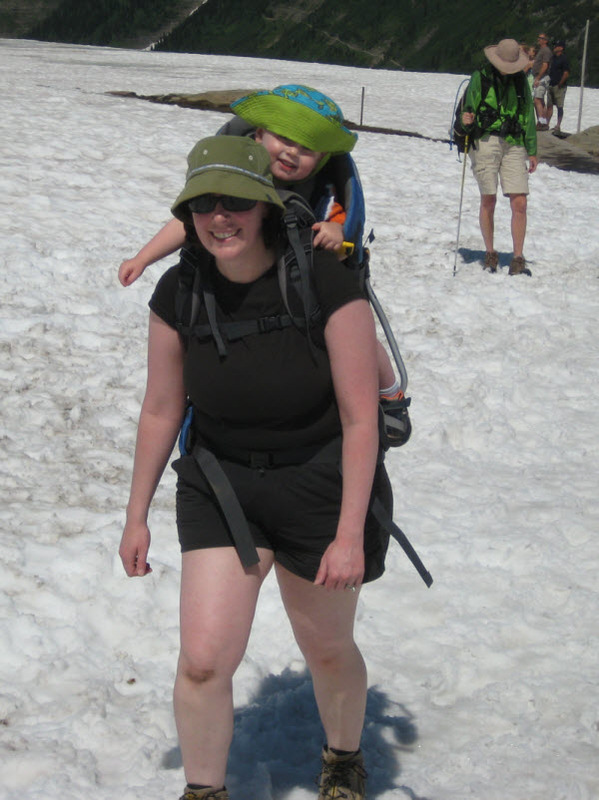 Then we loaded him onto my back and kept walking. We crossed the Continental Divide shortly before the overlook. 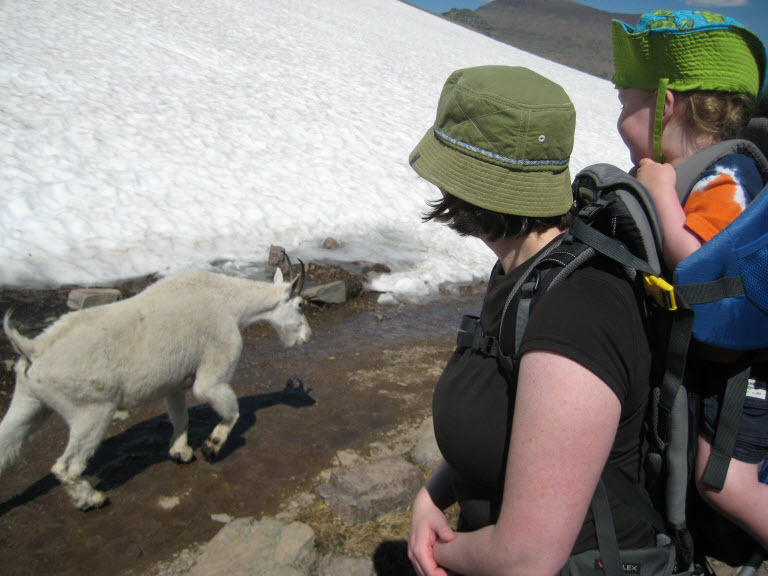 We also met up with half a dozen mountains goats along the way. It was a gorgeous day, sun shining, snow glistening, mountains towering above us. And we wouldn’t have experienced it if we hadn’t spontaneously added an extra day of hiking; if Kiddo hadn’t been napping at an inconvenient time; if we hadn’t missed our intended turnaround spot and ended up halfway up the mountain. Organizing is one of my personal strengths. I thrive on plans on checklists. But this trip reminded me that sometimes the best plan is the one where you throw the schedule out the window. 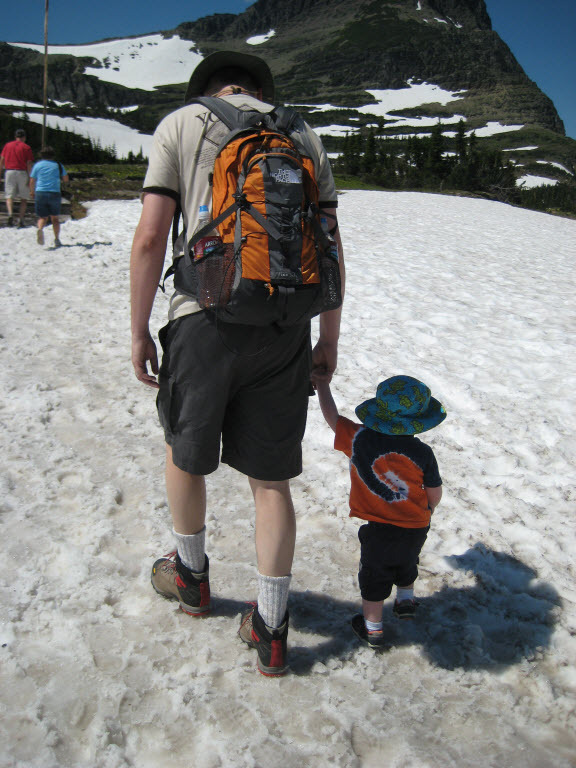 Categories: Family Time, Picture Post, Road Trip 2011, Travel | Tags: family trip, Glacier National Park, hiking, planning | Permalink. I'm a wife, mother, and software engineer living near Seattle, Washington. I like doing competitive puzzle events like the MIT Mystery Hunt and The Game. I've recently started learning a bit about candymaking, much to the delight of my husband, friends, and co-workers. I still have trouble with that concept, so congratulations to you if you have recognized it’s merits as a possible planning technique. No motel reservations? That had us ending up one night at a motel in North Bend, WA, an experience none of us ever wants to repeat.